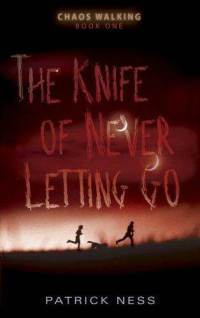 The Knife of Never Letting Go by Patrick Ness is a very good book. It is about a 12 year (and 12 months) old boy (not a man yet) named Todd, who lives in a town called Prentisstown. Though, Prentisstown isn't like any other town, it's on an alien planet that has a germ that makes all your thoughts be heard by everyone else (and animals able to talk). This germ killed all the women in the town, so now they are a dying civilization on a alien planet. But one day Todd stumbles upon a area of silence, which leads him to discover some horrible secrets about his towns past. Manchee's an extremely funny character, who's just so easy to love. Throughout the book he serves as a comedian (and I love him anyways). Todd certainly has different perspective about Manchee, than my family members and I do. Down under the picture I have a spoiler about the books that has to do with something I've been talking about. Keep an eye out for the sequel 'The Ask and the Answer'! I cried when Manchee died! It was so sad, because Todd had to choose between Manchee and Viola (the girl he meets in the swamp). I CRIED!!!!!!! !